The Archives has recently received a small collection of materials which once belonged to Cecil Elmer Argue (1888-1974), who was elected Mayor of Deseronto in 1929. Cecil and his wife Elizabeth moved to Belleville, taking a few mementoes of their time in Deseronto with them. This items have now found their way back to the town and we have scanned them and made them available online, along with some supplementary materials from the Archives which also date from 1929. This was from a major event commemorating the 145th anniversary of the United Empire Loyalists‘ arrival in Canada. The celebration lasted four days, as the pennant shows. 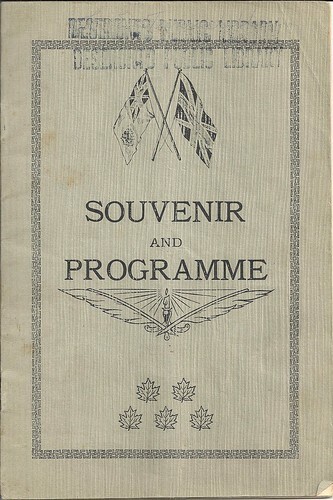 One of the additional items we have digitzed is the printed souvenir and programme of the day. This document details the many events held in June of 1929, several of which would have been presided over by Cecil E. Argue in his role as Mayor. The Town called in representatives of higher levels of government to take part in the celebrations: the Premier of Ontario, G. Howard Ferguson, gave a speech, as did the Minister for Labour, Peter Heenan, and the Superintendent-General for Indian Affairs, Duncan Campbell Scott. We are left with the impression that the Loyalist Celebration event was seen as an opportunity by Mayor Cecil Argue and his fellow town officials to regenerate the declining fortunes of Deseronto. 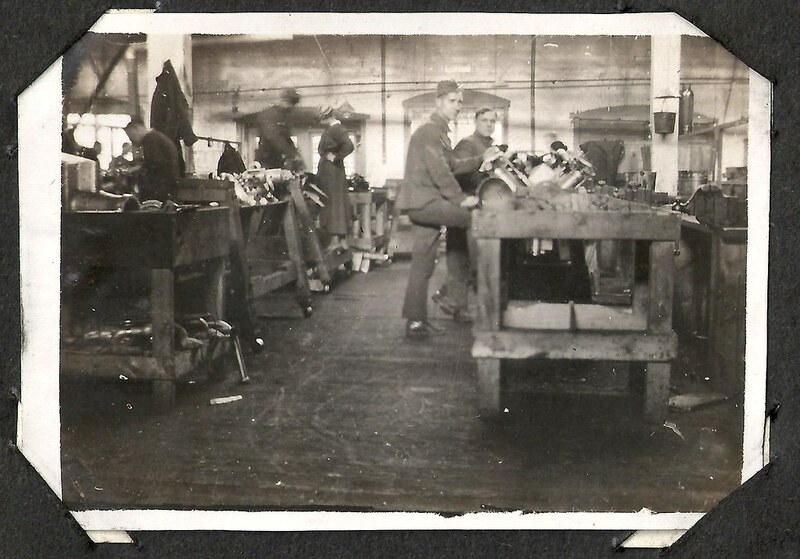 But with the Wall Street Crash of October in that year and the Great Depression which followed it, it seems that no-one was in a position to “Come to Deseronto” and take advantage of its “valuable Manufacturing Sites”. Cecil Argue himself did not stay in Deseronto to complete his term as Mayor: in the same year that he oversaw the Loyalist Celebration, he left the town and moved to Belleville, where he lived for the rest of his days. Unsurprisingly, it was the Rathbun Company who were contracted to build the lighthouse, for the reassuringly precise estimate of $437.49. Construction of the light had been completed by the time of the Department’s report. We next hear of the lighthouse in the Departmental report for 1885 (Sessional Papers for the Dominion of Canada, Volume 9,1886). 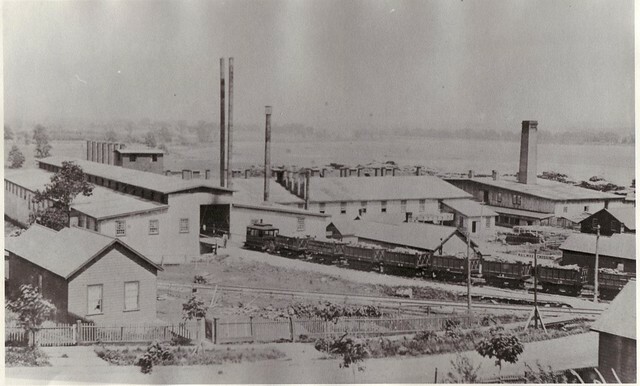 Here we learn that the Rathbun Company supplied the gas to the light and that the light was constructed on the roof of the freight shed of the Bay of Quinte Railway at the Rathbun Company’s wharf. It’s interesting to see that the Rathbun Company went a little over their budget, spending a total of $455.55. A search on our Flickr images reveals several photographs which show the light in place on that building. 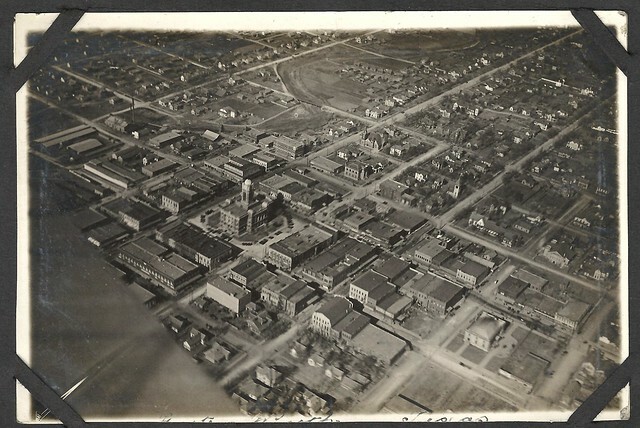 In the background on the left, you can see the brick head office building of the Rathbun Company, from where its owners could keep a close eye on the activities of the wharf. None of these buildings survive today. Sometimes the bald information in records of the past can conceal stories of human suffering and loss. But those bare bones of birth, death, marriage and census details can also be used to give structure and meaning to half-remembered family stories and newspaper reports from days gone by. On the afternoon of Saturday, 25th inst., Philip Gaylord, an employee of the Cedar Mill, was the victim of an unfortunate accident which was followed with fatal results. He was employed as a teamster and was engaged in hauling cars loaded with refuse from the mill to the yards. 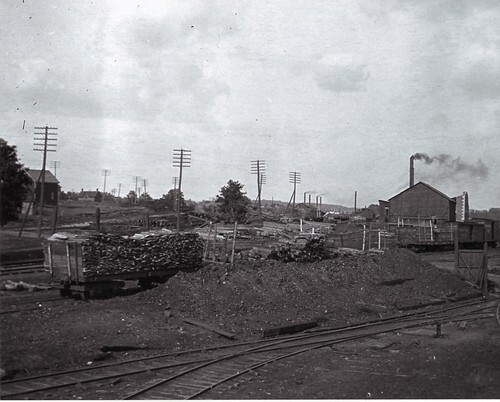 About the middle of the afternoon he left the mill with a loaded car and had almost reached its destination in the yard east of the Chemical works. It happened, however, that one of the pieces of stuff on the car projected too far from the load and as the car proceeded along the track between two piles of wood, this piece was caught and as the horses moved on it was swung about, throwing Gaylord from the load. He fell on the rails, and the loaded car passed over him, the wheels mutilating him in a dreadful manner. Mr. Donaldson, the foreman of the yard, witnessed the accident and ran immediately to his assistance. He was conveyed at once to Dr. Newton’s surgery where it was found that his right arm was nearly cut off, the bones being shattered to the very shoulder, while the right leg was also fearfully mangled. Dr. Newton immediately amputated the arm at the shoulder joint, and the leg above the knee; he also amputated the great toe of the left foot which had also been crushed. The young man bore the operation well, but the terrible shock was too great and after midnight he began to sink rapidly and he expired at an early hour on Sunday morning. The funeral took place on Sunday afternoon and was numerously attended. The deceased, who was 21 years of age, was the son of Levi Gaylord, of the township of Arden. He was a steady young man and had gained the good will and respect of his companions and fellow workmen. His sudden cutting off is rendered more sad by the fact that he was to have been married in the course of two or three months. His last words, somewhat indistinctly uttered, expressed a message which he wished to be conveyed to his betrothed. The obituary was discovered on this blog by a researcher who was trying to find out about the parentage of a woman called Minnie May Penny who was born in January 1889. The family story had been that she was adopted by Charles and Emma Penny in Arden after one of her parents was killed in a railway accident that spooked some horses. Marriage and census records show us that Emma Penny’s father was Levi Gaylord and that she was therefore the sister of Philip, the man who died in Deseronto in August 1888.The similarity of the family story and the information from the obituary strongly suggests that the soon-to-be-wed Philip was Minnie’s father. Minnie’s date of birth was January 4, 1889 and in the 1891 census we find her living with the Pennys in Arden and carrying their surname, which bears out the family story that she was adopted by them. Now we know from the information in the newspaper story that the Pennys were her paternal aunt and uncle. But who was Minnie’s mother? We had a date of birth for the child, but no name for her mother apart from a family story that it might have been Haws or Boomhower. This time, it was the Ancestry website which was the best source of information. 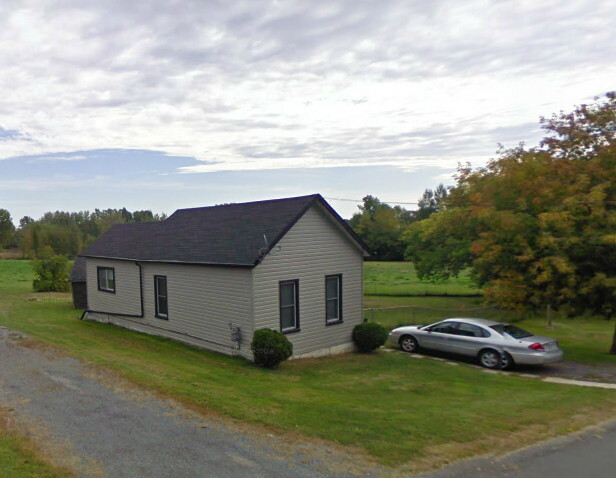 A search on Minnies born in Ontario on January 4, 1889 brought back a likely match: Minnie Hawes was born to Ida Hawes of Olden Township, Frontenac County (not far from Arden) on that day. No father’s name is given on her birth registration, but the matches between the family stories and the records mean that Philip Gaylord and Ida Hawes are highly likely to be Minnie’s parents and that Philip’s ‘indistinctly uttered’ last words had been meant for Ida, the woman he had planned to marry. Ontario’s marriage records show us that Ida went on to marry a man called Stephen Dolan in August 1892, by which time Minnie was living in Arden with her aunt and uncle. Minnie herself married a man called Robert Loyst in 1905 and by 1911 the couple had three children and were living in Nipissing. We can hope this was a happy ending to a life which had such an unfortunate beginning.